2-1-2 (2% nitrogen - 1% Phosphate - 2% Potassium) plus added micronutrients with lots of calcium, magnesium, iron and other micronutrients that release quickly to roots. Granular formula - no mixing with water. All Plants: Designed to grow bigger roots on all plants. Bigger roots take in more water and nutrition growing bigger plants. All Plants - annuals, perennials, vegetables, trees, flowering bushes, shrubs, houseplants, germinating seeds - any plant with a root system. Use Once Per Season. Springtime - Summer - Fall - Around perennials & bulbs. When planting annuals, vegetables in the ground or containers. Use on all your plants. Garden Beds: Sprinkle 1 scoop Rootblast into hole, position plant and fill in with soil. Be sure no air pockets. And water throughly with a gentle spray. Baskets/Containers/Grow Bags: Add 1 or 2 scoops of Rootblast into soil, position plant and fill in with soil, water. In Ground: Sprinkle one scoop (1 tsp) for every 12inches of drip-line. Away from the base out to the end of stems or branches. 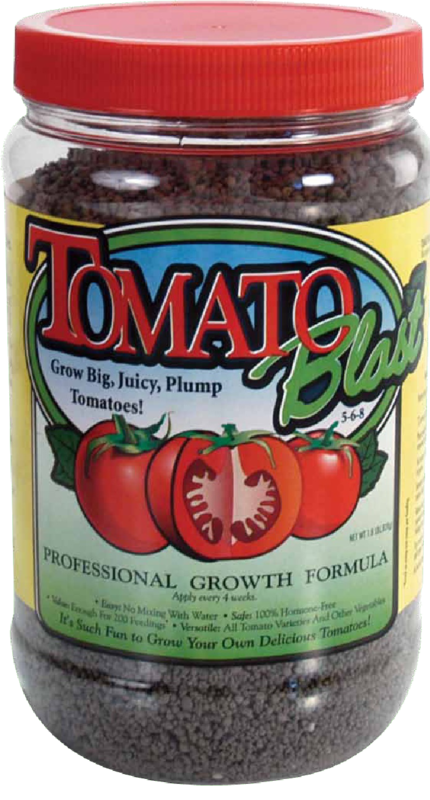 Seeds: Add 1/4 tsp with seeds or broadcast 1 tsp per 12 inch line. New bedding plants and 6 to 10 inch pots use one scoop (premeasured scoop included with product - 1 tsp). Add another scoop to larger pots. Established plants: sprinkle one scoop per 12 inches of drip-line around plant. (Dripline around the plant away from the base of the plant out to the outer branches.) Seeds: one scoop per 12 inch seed row or 1/4" - 1/2" scoop per 4" - 6" cell pack. Grows bigger roots for faster plant growth and helps anchor plant. Less transplant shock. Deeper roots makes plants more drought resistant. 5-6-5 (5% nitrogen - 6% Phosphate - 5% Potassium) Plus added Micronutrients and Organic trace elements. Slow release 3 to 4 weeks. Granular formula - no mixing with water. Designed for all flowering bushes, perennials, annuals and houseplants. You can use this on vegetables and other plants as well. Very nice All Purpose balanced fertilizer. Ideally, apply two weeks after Rootblast or start with this fertilizer. Reapply every 3 to 4 weeks as needed for continued growth and blooms. Sprinkle one scoop (1 tsp.) for every 12 inches of drip-line. Away from the base out to the end of stems or branches. Gently work into soil and water. One scoop (1 teaspoon) per 12 inches of drip-line. Or one new bedding plant. Re-apply every 3 to 4 weeks. Balanced formula for fast, healthy growth. Conditions soil for better moisture capacity. More resistant to disease and insects. 8-6-5 (8% nitrogen - 6% Phosphate - 5% Potassium) Plus added Micronutrients and Organic elements. Slow release up to 4 weeks. Granular formula - no mixing with water. Use with new seed, sod or existing lawns. Can be applied right with seed without harm of burning. Fix pet, dry or brown spots by taking up dead grass, sprinkle a little seed and Grassblast. Apply to thin grass to thicken and choke out weeds. Apply up to three times per season. Early Spring - Early Summer (before it gets upper 80 - 90's everyday) and again in Sept. or Oct.
Spreader: Use setting number 4 for spreaders. By Hand: One teaspoon per 1 sq. foot (12 " x 12") or Three tablespoons per 1 sq. yard (36" x 36"). One teaspoon per 1 sq. foot (12 " x 12") or Three tablespoons per 1 sq. yard (36" x 36"). One pound per 100 sq. feet. Build thicker grass, choking out weeds. Environmentally safe to use. Organic blend - Phosphate 99% organic. 5-6-8 (5% nitrogen - 6% Phosphate - 8% Potassium) Plus added Micronutrients and Organic elements. Slow release up to 4 weeks. Granular formula - no mixing with water. Designed for all tomato varieties and vegetables. Can be used on all plants without harm of burning. Added Potasium, Calcium and Mangnesium helps fight against tomato blossom end rot. Ideally, apply two weeks after Rootblast or start with this fertilizer. Reapply every 2 to 4 weeks as needed for continued growth and yield. One scoop (1 teaspoon) per 12 inches of drip-line. Or one new bedding plant. Re-apply every 2 to 4 weeks. Formula for strong, healthy plants. Balanced with added Potasium to help fight tomato blossom end rot. Get Homegrown Safety by growing your own tomatoes and vegetables. Plus, bigger, better tasting tomatoes! 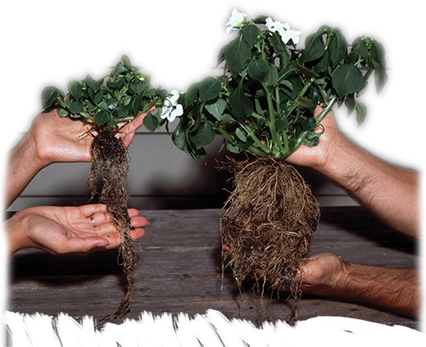 Rootblast can be used on all plants from seeds, seedlings, annuals, perennials, vegetables, trees, bushes and houseplants. For your perennials, trees and other plants already in the ground, just sprinkle Rootblast around the drip-line of the plant. 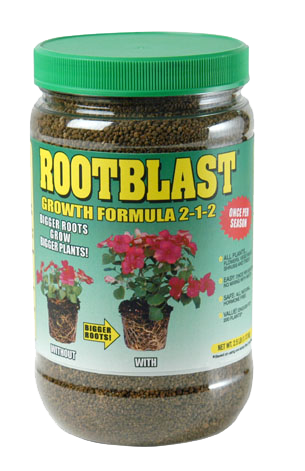 Use Rootblast once per season and watch your plants grow! It’s easy too… no mixing with water. And best of all it is all environmentally safe and hormone free! All plants, trees and bushes keep developing small feeder roots throughout their life spans so Rootblast is good for all plants young and old. Bigger Roots Grow Bigger Plants! Use the following directions as guidelines when applying Rootblast to your plants. Wait two weeks before applying additional fertilizer. Sprinkle 1-scoop (1 tsp.) of Rootblast into hole, position plant and gently fill soil around roots. Gently pack soil and water thoroughly. Sprinkle 1-scoop (tsp.) of Rootblast per 12-inches of plant drip line. (The drip line is the circumference of the green growth of the plant.) Gently work Rootblast 1-inch into the soil and water thoroughly with a gentle spray. Sprinkle ¼-scoop (tsp.) into each hole, or 1-scoop (tsp.) per 12-inches of seed row. Drop in seed(s) and cover with soil per seed packet instructions. Water thoroughly. IMPORTANT: Water thoroughly after applying Rootblast. Wait two weeks before applying any additional fertilizer. Do not apply more Rootblast than recommended. When repotting you should choose a pot or container that is one size larger than the one being used if the plant is to large for the pot. When planting in a container that is 6-inches or smaller mix 1-scoop (tsp.) of Rootblast with soil. For larger containers add another ½-scoop (tsp.) of Rootblast for every additional 2-inches of container. Water thoroughly. Mix 1-scoop (tsp.) of Rootblast with soil when planting in a 4 to 6-inch container. For larger containers add another ½-scoop (tsp.) of Rootblast for every additional 2-inches of container. Water thoroughly. Sprinkle 1-scoop (tsp.) of Rootblast around each plant. If you do not want to take the time to do each plant individually, you may broadcast one scoop per 1 square foot. Water thoroughly with a gentle spray. Sprinkle half scoop (tsp) per 6 to 8 inch pot. Gently work into soil and water well. Choose a pot that is one size larger when repotting overgrown plant. Dig hole two times larger than the plant’s root ball. Sprinkle 1 scoop of Plantblast into the hole, position plant and gently fill soil around roots. Gently pack soil to be sure no air pockets are around the root base and water thoroughly. 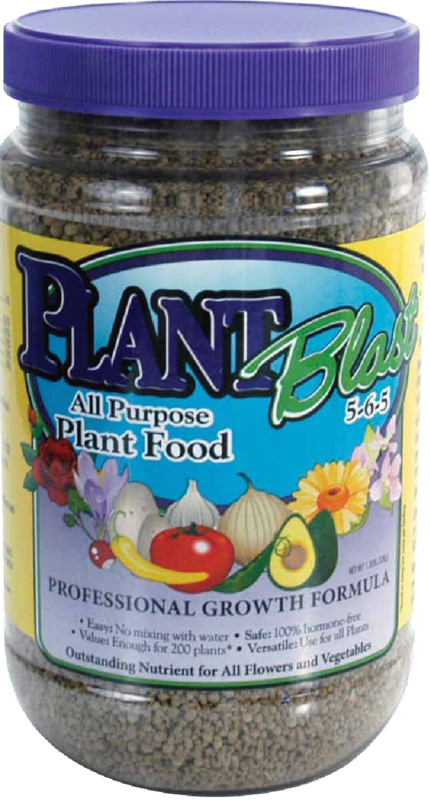 Mix 2 scoops of Plantblast for every gallon of soil. Maker sure pot has good drainage. Reapply every 3 to 4 weeks. Clear away dead leaves or mulch from around the drip line of the plant. Sprinkle one scoop of Plantblast for every 12 inches of drip line and gently work into soil and water thoroughly. Plantblast can be applied every 3 to 4 weeks as needed throughout the spring and summer. Water thoroughly after each application. In cold areas stop applying to outdoor perennials in the fall so the roots can prepare for winter weather – be sure to apply mulch before frost. Sprinkle 2 to 3 scoops of Tomatoblast evenly over soil surface, below branches, away from base of plant. (This is the drip line) Lightly scratch into soil and water thoroughly. Tomatoblast can be applied every 2 to 4 weeks as needed throughout the growing season. Water thoroughly after each application. Dig hole two times larger than the plants root ball. Sprinkle 1 scoop (tsp) of Tomatoblast into hole before planting. Mix 3 scoops of Tomatoblast throughout bag when planting for best results. Add 3 scoops every 2 to 3 weeks throughout growing season. 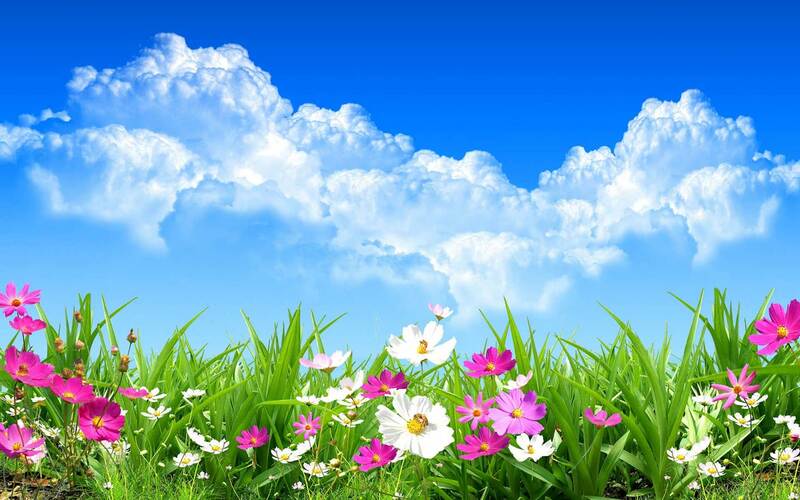 Apply fertilizer in mid-spring, late summer and late fall. 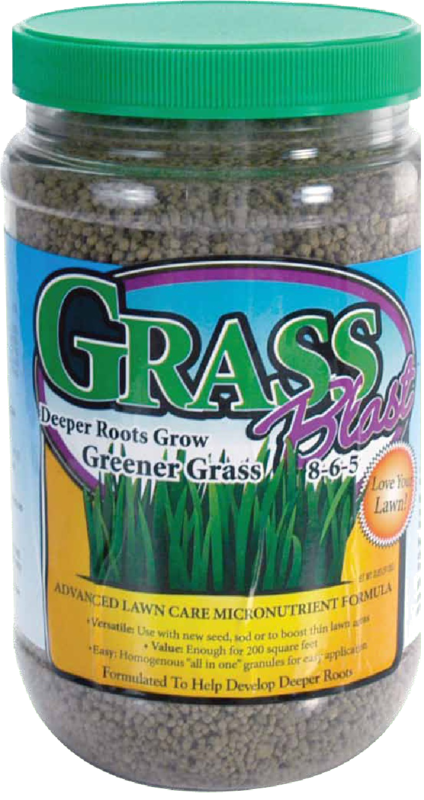 Grassblast was formulated to foster robust root development of the germinating seed and new root development of seedlings and existing grasses. Grassblast may be applied to existing lawns for general feeding; or as a superb patch formula for problem areas such as brown dry spots, bare spots, dog spots, sparse growth areas, new sod or seeded areas. Mow lawn, remove leaves and dead grass, etc. Rake, loosen or aerate the spot. Sow the appropriate or desired seed and gently rake to cover. Then sprinkle recommended rate of Grassblast evenly over the area. Keep the area well watered until the seeds germinate and grass as grown sufficiently to cover spot, then water as needed. Follow instructions on the grass seed package for soil preparation then apply Grassblast at the recommended application rate. Grassblast can be applied before or after spreading seed. Apply Grassblast at the recommended rate prior to laying sod. If sod already placed Grassblast can be applied to sod and water well.